Yank the army weekly, Feb. 9, 1945.,vol. 3 no. 34., 5 cents cover story What jap prisoners think about the war and us. front picture is of a bartender from brooklyn., Back cover is cartoons., some small tears on back cover, front cover has small tear near binding and has user wear on cover some discoloration., otherwise good condition. 14 x 10 1/4" , Postage will be 3.20 in the USA, If you purchase more than one of these (there are 7 listed) no additonal postage. 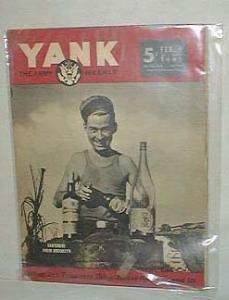 Items Similar To "Yank the army weekly, Feb. 9, 1945.,vol. 3 no. 34 featuring Barte..."